I need to make dinner. And I'm really craving chicken parmigiana. I scrounge through my pantry and fridge to see if I have all the ingredients. And here's what I found, folks. To be honest with you...I just may never buy bread crumbs again! Cut the bread into cubes, and process the cubes in a food processor to make coarse crumbs. Spread the crumbs onto a baking sheet - use two baking sheets if necessary - and dry the coarse crumbs in the oven for about 10 - 15 minutes, stirring halfway through the baking time. Allow the crumbs to cool completely. Return the dried crumbs to the food processor. Add the seasonings. Pulse until the crumbs are finely processed and well-mixed with the seasonings. 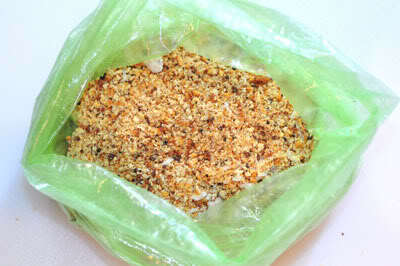 Be certain the seasoned bread crumbs are dry and cool before storing in an airtight container. The bread crumbs should last for up to 6 months. I NEED that recipe, Jess!! They sound marvelous!